HALLOWEEN COCKTAIL BOOK NOW AVAILABLE AS E-BOOK! Just like the print book which is available on Amazon, The Halloween Martinis & Munchies E-Book is a Spooky Spirit of Creepy Cocktail Creativity that will put the boo in your booze and the spook in your spirits, accompanied by Halloween themed party recipes, trivia and limericks to entertain until the stroke of midnight - or later. 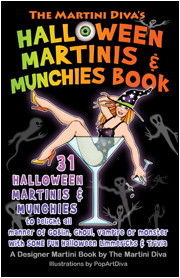 Full color throughout, The Halloween Martinis & Munchies E-Book is over 70 pages of martinis, munchies and mad mayhem in the true spirit of All Hallows' Eve. for a Monsterlicious Cocktail & Appetizer Recipe for every day in October! Don't have the ADOBE READER? Get it FREE here! HALLOWEEN MARTINI #2 of 31 Boozelicious Martinis! to Save, Send or Share...they also make great Customizable Halloween Party Invitations!